We offer a large selection of furniture for schools. school furniture and equipment at a fair price. Our blog is a great resource for anyone looking to get new ideas for school furniture and school equipment we sell. Many schools, colleges, and universities purchase products from us but set them up differently for their unique needs. Browse our posts below and let us know if we can help you with a design session or your school has a specific need that you’d like to get a consultation for. 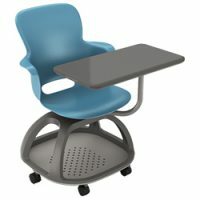 The classroom chairs and tables students use can greatly impact their ability to learn. Today’s supportive seating is designed for durability and comfort. Classroom chairs carry more of a responsibility than many administrators and teachers realize. The aged formatting of rows of chairs with each student staring at a classmate’s head is ineffective. 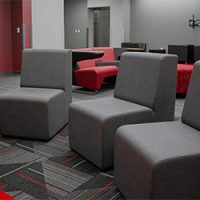 Supportive seating that is easy to move and allows for group learning boosts a student’s experience. Research shows students are more open to learning and engaging in the classroom when they’re free to move. Flexible seating options create the ideal classroom setting. 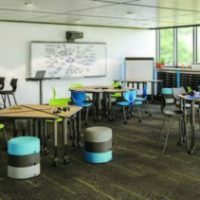 Flexible seating classroom options give kids ownership over their learning and Columbia Manufacturing is leading the way with numerous styles. 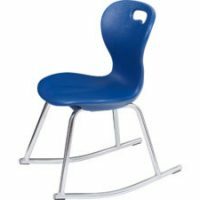 From mobile stools and chairs to rockers in the classroom, students and teachers are experiencing the benefits of flexible seating chairs. Dining times for students can often be filled with stress and seclusion. Traditional school dining furniture is designed for small groups and make it easy for students to get lost in a crowd of cliques. SICO recognized the need for change and developed an Enriched Dining Experience for k-12 schools. Students today aren’t just sitting and eating during their dining period. 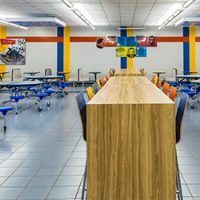 From catching up with friends to scraping together last-minute homework assignment, students need more flexibility and inclusion when in comes to school cafeteria seating. As schools become more dependent on electronics as a source of learning rather than traditional textbooks, there’s been some argument that school lockers aren’t as necessary as they once were. However, there are elements of a student’s day and school storage needs that are dependent on traditional and sport lockers. Students have the ability to learn more when they are in a fun setting. Research reveals that stress, boredom, and low motivation can interfere with learning. Keeping the attention of a classroom full of children is harder than ever in today’s technology-driven world, but the answer is simpler than you may think. School seating can shape the way your classroom affects your students. With flexible seating options, students are more comfortable and can learn from a variety of viewpoints. Learning is not a spectator sport. In order to get the most out of the classroom experience, students need to be engaged with the teacher and one another. For decades, classrooms were equipped with heavy, immobile desks that forced students to look straight ahead, inhibited their learning, and made sitting painful. Modern classrooms are designed with collaborative furniture that supports student exploration and flexibility. 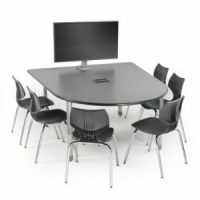 Securing a good school furniture distributor partnership with a company that provides quality classroom pieces ensures you can furnish classrooms when needed, even through Quick Ship programs. Finding a distributor you trust will mean speaking with a number of companies and exploring the option to buy on BOCES and state contracts. 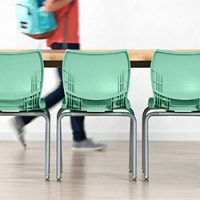 If you’re in the market for a reputable school furniture distributor, here are key topics to broach with any contending companies. Have you realized that you may not have enough school furniture for your classrooms? Did you receive some unexpected last-minute enrollments? If so, don’t panic. Today, QuickShip programs allow you to order last-minute items so that everyone has a seat in your classrooms. Better yet, companies like SmithSystem have a variety of QuickShip classroom furniture options for you to choose from so that your students are as comfortable as possible during their lessons. In today’s school environment, students need a safe place to store their belongings. 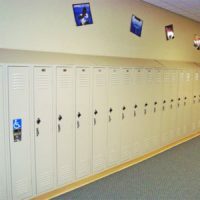 High school hallway lockers not only act as a secure storage area, but they also offer students independence and help relieve them of carrying a backpack full of books and equipment to each class. 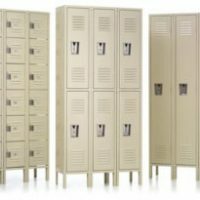 When considering school lockers for sale and what style best fits your facility’s needs, remember these five benefits offered by quality school lockers. Do you remember when the science tables in lab class were immobile, heavy pieces of equipment sounded by rusty metal stools that creaked with every movement? It’s no wonder science class was the dread of anyone born before 1985. 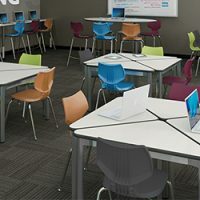 Today’s classroom tables, especially those designed for STEM (science, technology, engineering and math) learning, are not only ultra-comfortable for students, but modern classroom tables are also multi-functional and versatile to allow for interactive learning.